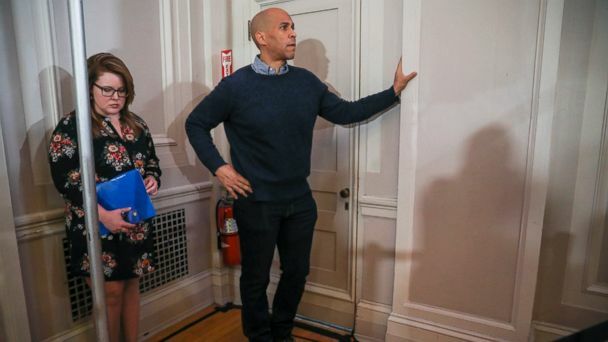 Sen. Cory Booker hasn't made a decision yet on whether he'll run for president in 2020, but he said in New Hampshire on Saturday that he'll make a verdict in about a month. Booker, D-N.J., was in the country's first primary state on Saturday for a number of events. He was the key speaker at the state's Democratic post-midterm celebration in a crowded auditorium at New Hampshire Institute of Art in Manchester. He was also guest of honor at a house party in Nashua hosted by former state Sen. Bette Lasky -- alongside Nashua Mayor Jim Donchess and state Sen. Cindy Rosenwald. He was in a spirited mood at both, but talked little about his presidential ambitions. He was more candid about his plans Saturday morning. "During the holidays I'm gonna sit down and take a lot of stock about what I want to do next -- whether I want to run for president or stay in the Senate and help this continued movement in our country to reinvigorate our democracy," Booker told Manchester ABC affiliate WMUR in a one-on-one interview. That he's considering a run for the top of the ticket is hardly a surprise. He's been testing the waters in both Iowa, the first caucus state, and New Hampshire for months. Booker was in Iowa on Oct. 6, exactly one month before the midterm elections. There he railed against the nomination of Brett Kavanaugh to the Supreme Court after grabbing national headlines during the confirmation hearings. On Saturday, Booker echoed the last Democratic president speaking about "hope." "The definition of hope isn't that you see some light at the end of the tunnel, or something on the horizon that gives you hope -- hope is generated from within," he told the overflow crowd in Manchester. In Nashua, Booker spoke at length about his own personal story growing up in New Jersey split between inner-city Newark and suburban Upper Saddle River and the issues facing New Hampshire, including the opioid crisis. New Hampshire has the second-highest number of overdose deaths in the nation: 35.8 people per 100,000 in 2016, according to the National Institute on Drug Abuse. "This incredible city is struggling with opioid addiction, struggling with mental health issues," Booker said, referring to Nashua. "They're struggling with what my region is struggling with." The house party also drew a large number of people, in the very same place Barack Obama held a similar event in 2007 when he was a senator. "We've never seen it as packed as this and we've hosted quite a number of political people here," Elliot Lasky, an optometrist in Nashua who attended the party, told WMUR. Booker will spend a second day in the state on Sunday in Keene. The senator is part of a crowded field of potential Democratic contenders -- though none have thrown their hats in the ring officially. Former New York City Mayor Michael Bloomberg, New York Sen. Kirsten Gillibrand, California Sen. Kamala Harris, Texas Rep. Beto O'Rourke and Massachusetts Sen. Elizabeth Warren are among some of the top contenders to take on Donald Trump in 2020.